April 16, 2018 at 7:19 pm. 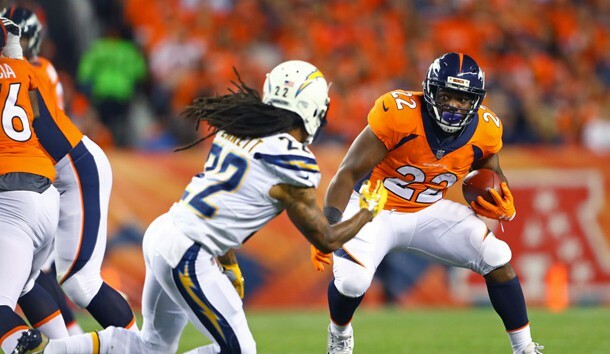 The Denver Broncos released running back C.J. Anderson, the team announced Monday. Anderson was informed of his release prior to a team meeting, ESPN’s Adam Schefter reported. The 27-year-old Anderson played just two seasons of the four-year, $18 million contract he signed in 2016. The Broncos will save $4.5 million on the salary cap by dismissing Anderson. The Broncos had tried to trade Anderson, according to multiple reports, but were unable to complete a deal. Anderson, who was selected to the Pro Bowl in 2014, rushed 245 times for 1,007 yards and three touchdowns last season and also had 28 receptions for 224 yards and a score. –Linebacker James Harrison announced his retirement from the NFL for a second time. Harrison, who will turn 40 on May 4, previously announced his retirement in August 2014 before returning to the Pittsburgh Steelers the following month. He signed with the New England Patriots on Dec. 26 and started for the team in its 41-33 loss to the Philadelphia Eagles in Super Bowl LII. –Minnesota Vikings linebacker Eric Kendricks signed a contract extension, the team announced. While the Vikings did not disclose terms of the deal, NFL Network Insider Ian Rapoport and NFL Network’s Mike Garafolo reported that the pact is worth $50 million over five years with $25 million guaranteed. Kendricks recorded a career-high 136 tackles last season — with 13 coming in victory over the Cleveland Browns. –The NFL and NFL Players Association will prohibit 10 helmet models from being worn by players this season based on the results of an annual laboratory study, the league and union said in a statement. Previously, NFL players could select any helmet as long as it passed current National Operating Committee on Standards for Athletic Equipment (NOCSAE) criteria for certification. Six of the models are banned immediately while the other four can continue to be used by players who wore them last season. –Cleveland Browns wide receiver Josh Gordon signed a one-year exclusive-rights tender, the team announced. The Browns did not divulge the financial terms of his deal, but NFL Network’s Tom Pelissero reported Gordon’s tender is worth $790,000. Fellow wide receiver Matt Hazel, offensive lineman Austin Reiter and fullback Danny Vitale also agreed to terms, the team announced. –Los Angeles Rams free safety Lamarcus Joyner is expected to participate in the first day of offseason workouts on Monday after the team announced that he had signed his one-year, $11.287 million franchise tag. Joyner will be part of a Rams secondary that includes recent cornerback additions Marcus Peters and Aqib Talib. Joyner started all 12 regular-season games in which he played in 2017, and recorded three interceptions, nine passes defensed, one forced fumble and 49 tackles. He also started the Rams’ one postseason game. –The Seattle Seahawks continued to add depth behind Russell Wilson by re-signing fellow quarterback Austin Davis, the team announced. The move comes on the heels of the Seahawks signing Stephen Morris last week. Davis did not throw a pass in his three games last season. Also, the Seahawks signed three exclusive rights free agents: center Joey Hunt, defensive end Branden Jackson and long snapper Tyler Ott. Linebacker Paul Dawson also signed a one-year contract. –Restricted free-agent wide receiver Adam Humphries signed his second-round tender with the Tampa Bay Buccaneers, the team announced. Humphries will make just over $2.9 million this season. The 24-year-old recorded 61 receptions for 631 yards with one touchdown in 16 games last season. –San Francisco 49ers linebacker Reuben Foster has legal matters to resolve and will not participate in team activities that were scheduled to begin Monday. The team made the announcement regarding Foster’s absence over the weekend. Foster’s representatives and 49ers officials are expected to meet some time this week to determine Foster’s schedule as it relates to team activities. Prosecutors charged Foster with felony domestic violence, another felony for forcefully attempting to prevent the victim from reporting the crime, and a third felony for possessing an assault weapon. Foster is also charged with a misdemeanor for possessing a large capacity magazine. –The Washington Redskins announced three moves targeting their offensive line. Restricted free-agent offensive tackle Ty Nsekhe signed his second-round tender with Washington, and the Redskins exercised their fifth-year option on the contract of guard Brandon Scherff. They also re-signed offensive lineman Tony Bergstrom. Terms of Nsekhe’s tender were not disclosed by the team, but NFL Network’s Mike Garafolo reported that the versatile offensive lineman is slated to earn $2.914 million in 2018. Scherff, 26, is now under contract through the 2019 season, and, according to the Richmond Times-Dispatch, Scherff’s $12.5 million option for next season would make him the league’s second-highest-paid guard. –Malik McDowell’s time with the Seattle Seahawks may be over before it started. Seattle used its first pick of the 2017 draft (second round, No. 35 overall) to take McDowell, a defensive tackle. He missed all of his rookie season because of injuries sustained in an ATV accident, and Ian Rapoport of NFL Network reported Monday that the Seahawks are expected to release McDowell soon. The Seahawks have not medically cleared McDowell, who suffered a concussion and facial injuries in the ATV accident last July. –Detroit Lions defensive end Ziggy Ansah plans to sign his $17.14 million franchise tender, NFL Network Insider Ian Rapoport reported. The Lions will then have until July 16 to work out a long-term deal with Ansah, who was not at the team’s offseason workouts last week as he was dealing with family matters in Ghana. Ansah is expected to sign on Tuesday. –The Buffalo Bills signed wide receiver Jeremy Kerley and defensive tackle Tenny Palepoi to one-year deals, the team announced. The Bills also re-signed four exclusive rights free-agents, namely tight ends Nick O’Leary and Logan Thomas, cornerback Lafayette Pitts and defensive end Eddie Yarbrough. Kerley recorded 22 receptions for 217 yards and a touchdown in eight contests with the team last season after serving a four-game suspension due to a performance-enhancing drugs. –The Los Angeles Chargers and defensive tackle Corey Liuget have agreed to terms on a revised contract, Ian Rapoport of NFL Network reported. Liuget was scheduled to make $8 million next season, but it was announced last month that he has been suspended for the first four games of the 2018 season for violating the league’s policy on performance-enhancing substances. That led to suspicions that the Chargers might release Liuget. Instead, Liuget agreed to a contract modification. Liuget, 28, started all 12 games in which he played last season, when he recorded 1.5 sacks, two passes defensed, one forced fumble and 21 tackles as a defensive tackle. –Guard Nick Easton signed his restricted free-agent tender with the Minnesota Vikings, the team announced. Easton will earn a little more than $2.9 million in 2018 after the Vikings used the second-round tender on him. Easton started 12 games for the Vikings last season, playing both guard positions as well as center during the season. He fractured his ankle in the Dec. 23 game against the Green Bay Packers, forcing him to miss the end of the 2017 regular season and the playoffs. –Former Philadelphia Eagles cornerback Daryl Worley has been charged with six offenses following an alleged incident near the team’s training facility, multiple media outlets reported. Worley was charged with driving under the influence, firearms carried without a license, carrying firearms in public, possession of an instrument of crime, resisting arrest and disorderly conduct/engaging in fighting following Sunday’s arrest. The Eagles released Worley hours after he was arrested. –The Chicago Bears signed wide receiver Bennie Fowler to a one-year contract, the team announced. Financial terms were not disclosed by the team for Fowler, who recorded 29 receptions for 350 yards and three touchdowns last season with the Denver Broncos.